Carrots are an excellent source of vitamins, potassium and folic acid. They contain a high level of beta-carotene, the pre-vitamin A that lends carrots their distinct orange hue – and are known for their health properties most notably for eye health. 1. Grate the carrot and onion. 2. In a bowl, mix the grated carrot and onion, grated keso de bola, flour, salt and pepper, LEE KUM KEE Oyster sauce, turmeric powder and egg. 3. Form the mixture into patties and fry. 4. For the sauce, combine all the ingredients in a sauce pan and heat for at least 3 minutes. 5. 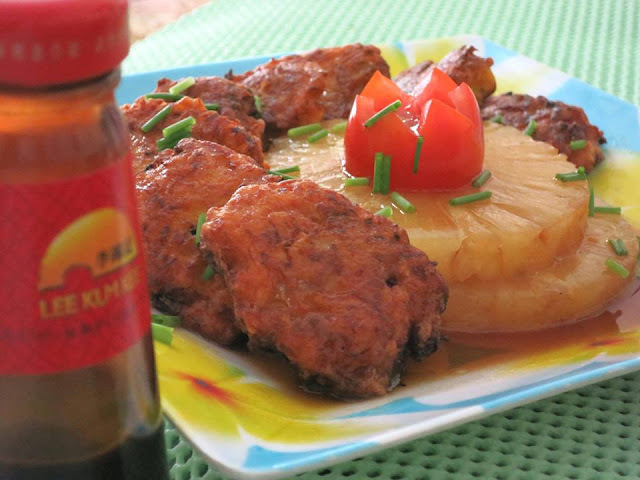 Plate the carrot patties and slices of pineapple, pour in the sauce. Serve with spring onions.